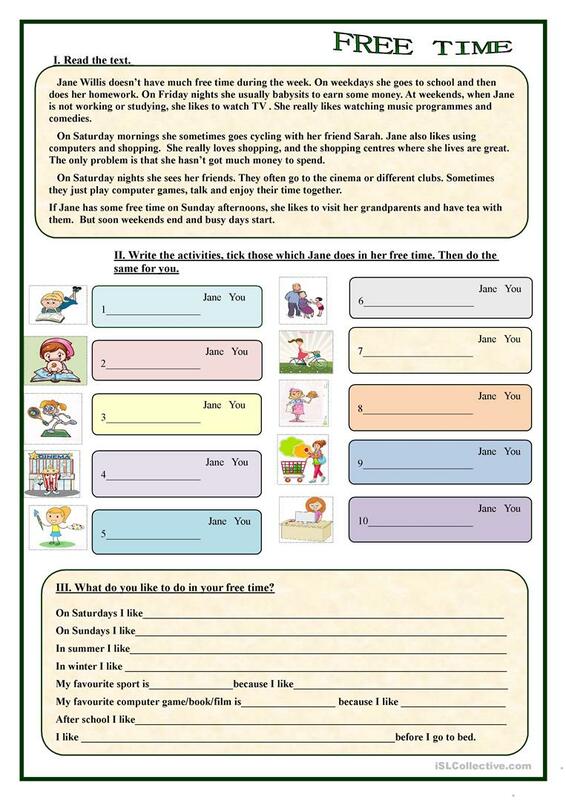 This worksheet contains the text and two exercises. Students have to read the text and write about different activities in their free time. Hope you find it useful. The present downloadable worksheet was created for high school students and elementary school students at Elementary (A1) and Pre-intermediate (A2) level. It is valuable for revising Present simple tense in English, and is useful for developing your students' Speaking, Reading and Writing skills. It features the theme of Free time, leisure activities. tantana is from/lives in Russia and has been a member of iSLCollective since 2012-11-28 17:09:54. tantana last logged in on 2019-04-24 05:21:29, and has shared 260 resources on iSLCollective so far.